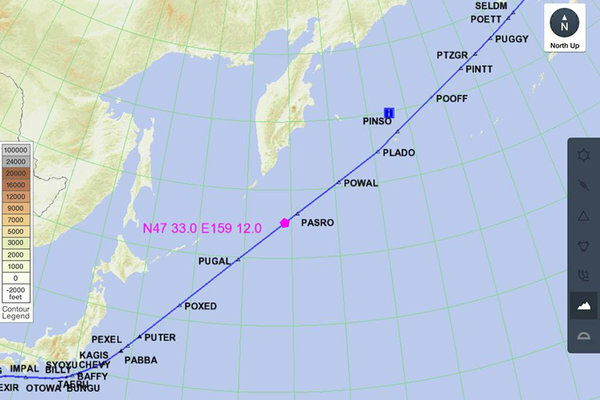 In the night of 24-25 August 2014, I flew one of our 747-8s from Hong Kong to Anchorage. 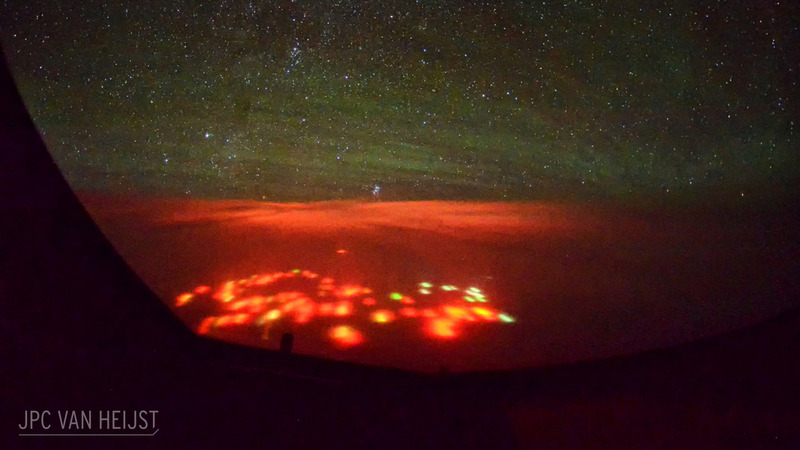 While flying over the vast Pacific Ocean, somewhere southeast of the Russian Kamchatka Peninsula, I had one of the strangest experiences of my life. 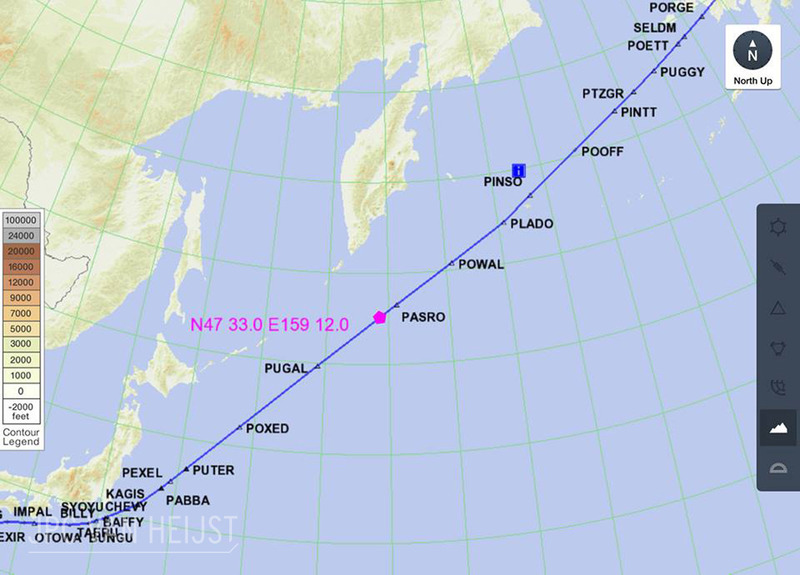 Around five hours into our flight with Japan a long time behind us, we were cruising at a comfortable 34.000 ft with about four and half hours to go towards Alaska. Over the radio, we heard Air Traffic Control talking to other planes that were heading for the US West Coast about diversions, due to major earthquakes in San Francisco. Inquiries with our company Operations Centre confirmed two nearly simultaneous massive earthquakes in San Francisco and Chile, and a large volcanic eruption in Iceland. Our flight was not expected to be affected by any of these events. But with our basic geographical knowledge, we knew that a lot of tectonic activity in the Earth’s crust could have a cascade effect around the world. With three active and soon-to-erupt volcanoes along our route in Kamchatka and Alaska, we figured that we could encounter one of the deeply feared ash-clouds if any of these would erupt. Suddenly, a long way off in the distance ahead, an intense light flash shot up from the ground, just at or beyond the horizon. It looked like a lightning bolt in a faraway thunderstorm, but a lot more intense and of a much shorter duration, as though something had exploded. I have seen countless thunderstorms, shootings stars, lightning bolts and stars but never a flash like this. And strangely enough, it was just one single flash, and we did not see any other flashes afterwards, which would be expected with a thunderstorm. 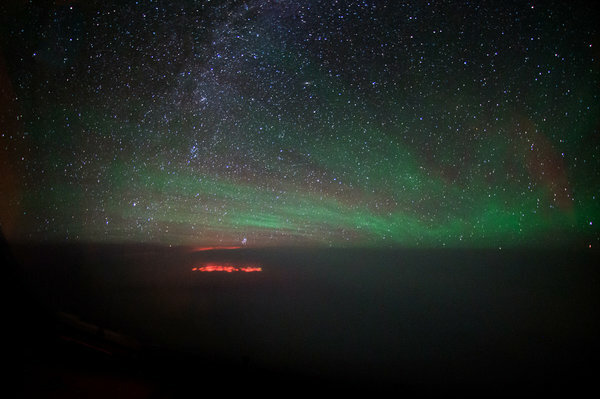 As later confirmed by two independent lighting-observatories, there was no electro-magnetic activity (lightning strikes) for two hours before and after the time of the sighting, in a radius of at least 1000 kilometres. Of course, we did not know that at the time and did not give it much thought, until much later that night. 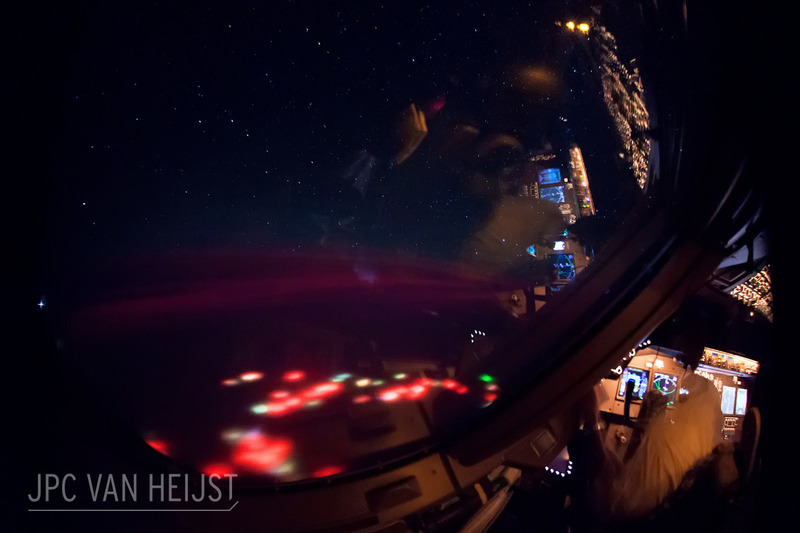 While my meal was warming in the oven, we dimmed the lights in the cockpit and I decided to try and take some pictures of the night sky and the so called ‘earth glow’ green faint glow that was visible all over the Northern Hemisphere. About 20 minutes later, I noticed a deep red/orange glow appearing ahead of us, and this was confirmed when I looked at preview of the photos on the back of my camera. There was supposed to be nothing but endless ocean below for hundreds of miles around us. They initially appeared as a distant city or group of typical Asian squid fishing boats, but this did not make sense in this area. The lights we saw were much larger in size than your average city or group of boats, but they also glowed red and orange, instead of the normal yellow and white that cities or ships would produce. 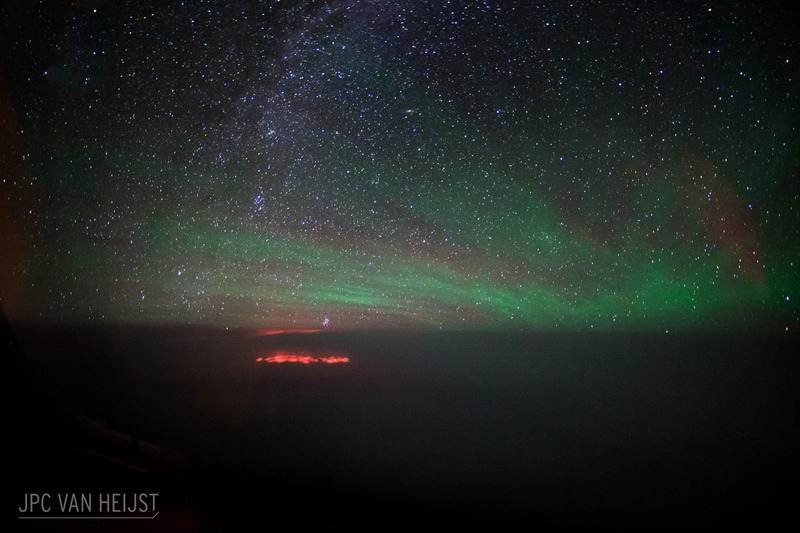 The closer we got, the more intense the glow became, illuminating the clouds and sky below us in a scary orange glow that you would expect with a massive fire on the ground. In a part of the world where there was supposed to be nothing but water. At that moment in time, with a lot of worldwide seismic activity going on that night, it did not seem illogical to us that we were witnessing a massive eruption of an (underwater?) volcano. Since flying into an ash cloud is the biggest threat to an aeroplane, we immediately focused on this danger and made sure we stayed out of all possible clouds that we might encounter. The nearest diversion airport was at least 3 hours flying away; this was not the place and time to run into trouble like losing all engines due to ash. Fortunately, we did not encounter anything like this, but together with the very creepy unexplainable deep red/orange glow from the ocean’s surface we felt everything but comfortable. There was also no other traffic near our position or on the same routing to confirm anything of what we saw or confirm any type of ash clouds encountered. 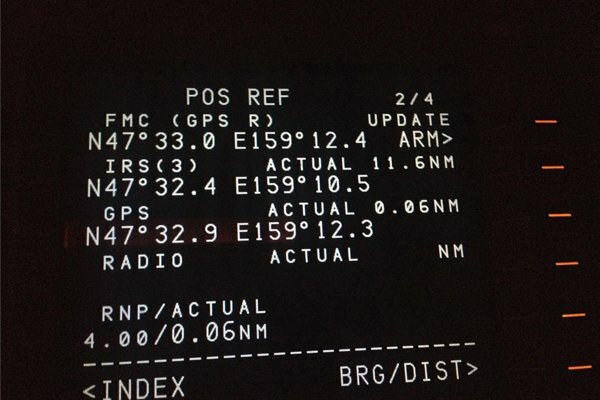 We immediately reported our observations to Air Traffic Control, but they also confirmed the next flight over that area was not expected until at least four hours later, by which time the sun would be already above the horizon. The photos I took of this strange phenomenon were picked up by a few journalists and went viral within thirty-six hours of taking them. They went all over the world on numerous websites, newspapers and blogs. From China to Russia, from the USA to the UK and everywhere in between. The seven days after the sighting, I spent giving telephone interviews, answering literally hundreds of emails and even got invited onto a famous Dutch TV show who unfortunately couldn’t wait until I was home. I was overwhelmed by the amount of attention these photos got, and now a few years later, without definite answers. hinting towards a possibly military source of the lights. Could explain the overall size of the group of lights and the stability of them. Does not explain the red color and the size of the individual lights. 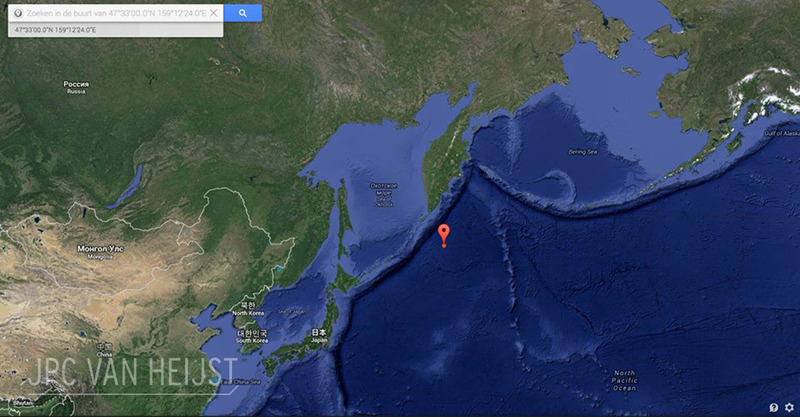 Also, the position so far out in the Pacific does not make sense. Massive groups of plankton are known to emit light. Problem is that bioluminescence is mostly blue and green and is by far not as bright as the lights we saw. 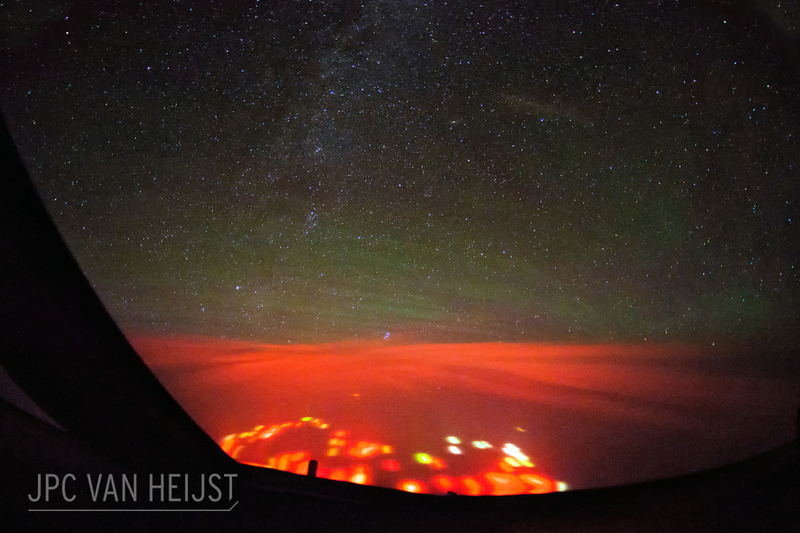 The lights even illuminated the clouds below us and had a strong power source. 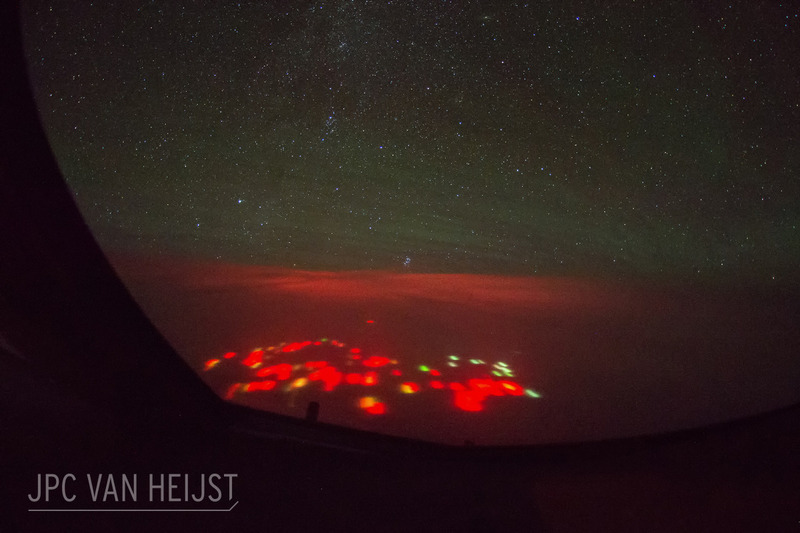 Could explain the bright flash we saw before and the high temperatures that could cause the red ‘glow’. Unlikely though, since debris on the ocean surface would normally sink fast and not stay afloat. 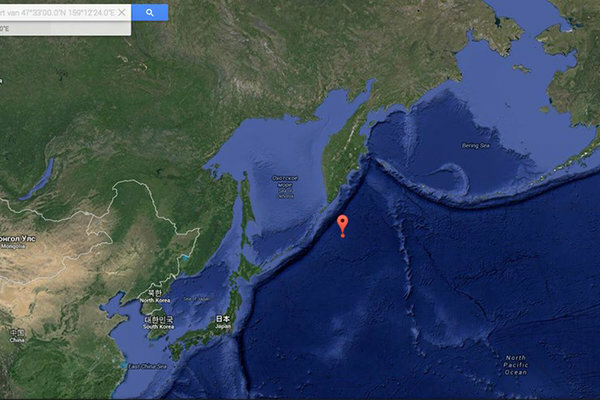 Possible massive Russian navy exercise or weapons test close to Petropavlovsk, one of the largest Russian naval bases and home to the Pacific nuclear submarine fleet just south of Petropavlovsk. 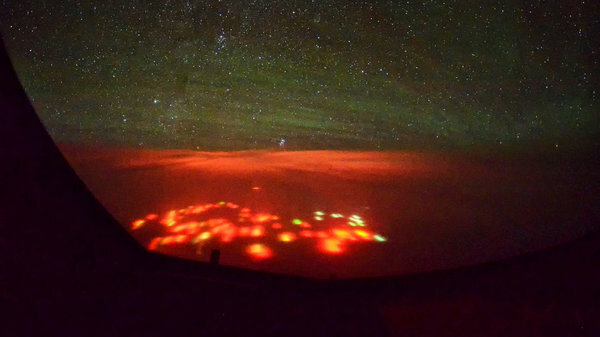 All things considered, this is so far the most realistic explanation: a military operation outside of Russian waters, but lights are too bright for ship illumination at night and are not logical; one would expect dimly illuminated ships to make sure personnel keep their ‘night vision’. On the other hand; airspace was not closed, nor a warning issued, so a missile test can almost certainly be ruled out even though it could explain the flash of light earlier. Unlikely to hear anything about this anymore if it really was a military operation. Earthquake lights are an often reported anomaly that occurs often before/during/after heavy earthquakes. Until a few years ago often reported as UFOs, since the 1960s earthquake lights are scientifically accepted as a side effect of earthquakes in various forms and colours. I have received very interesting documents from a number of highly regarded Russian and US scientists specialized in (electro-) magnetic discharges of the atmosphere into the Earth’s crust and vice versa. More research is done as we speak, cutting edge science supported by rather oblique evidence. 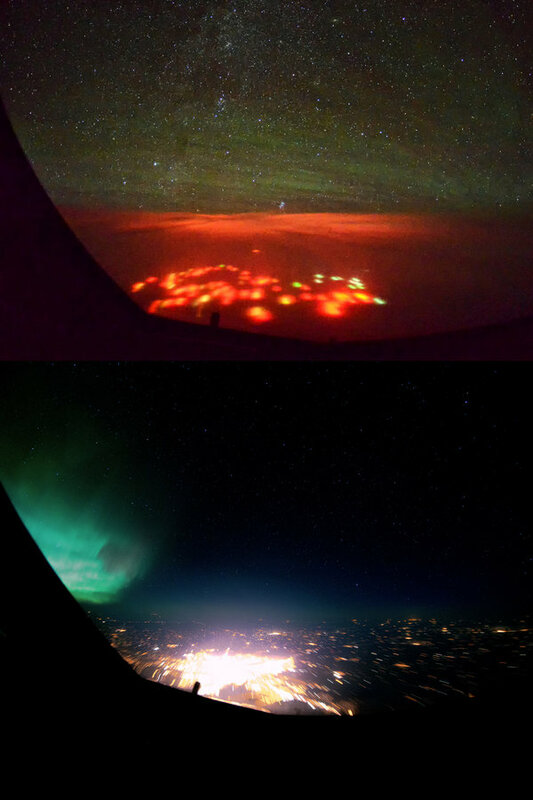 However, it could contribute some valuable science and a possible explanation for the mysterious lights. This area, south of Russia, was the location of the deepest earthquake known to man back in 2012 and documented back in May 2014, and could have caused a potential weakening in the Earth’s crust magnetic properties, causing a down peak in the energy flow. Earthquake lights are still mostly unknown but appear to shine only for a few minutes at the most. Many remarkably bright lights would indicate an extremely strong down peak of ionization, never observed before. Sounds interesting but I think a more down-to-earth explanation is more likely. Methane gas has been reported to break from the ocean floor and burst into flames when reaching the ocean surface. This could explain the size and intensity of the lights. Problem is that methane burns blue/white. It would have to be a large group of different gasses/materials burning here, since the individual lights had different colours. Also, it would have generated a gigantic plume/cloud. Theory seems unlikely. For now there is no conclusive explanation, though I think that the origin of the lights is man-made and after advice from some military-journalists and experts, I have the strong tendency to think the lights had a military source. 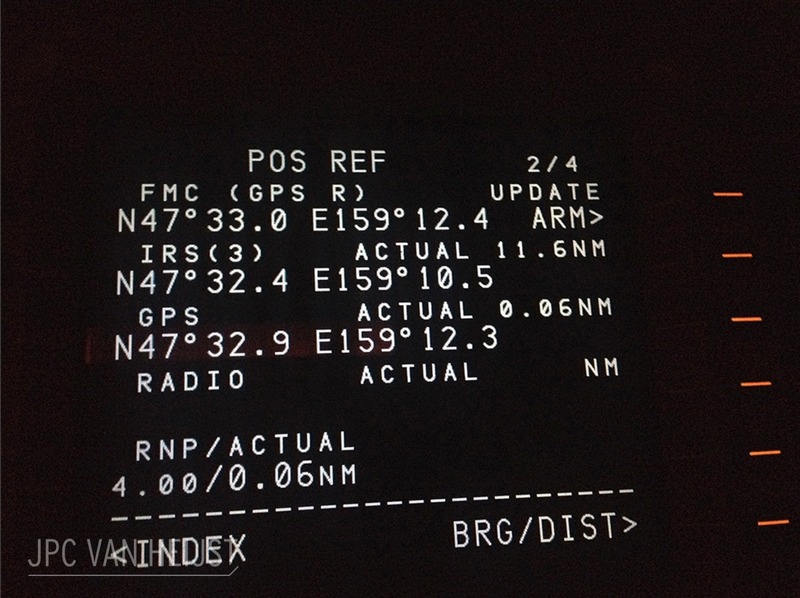 Location plotted on google maps, the Jeppesen Pro navigation app of my iPad and a picture of the gps coordinates, as indicated by our Flight Management System.